President Donald Trump posted a video on Twitter Tuesday night showing legendary Jamaican runner Usain Bolt cutting a live interview short to honor the U.S. national anthem. 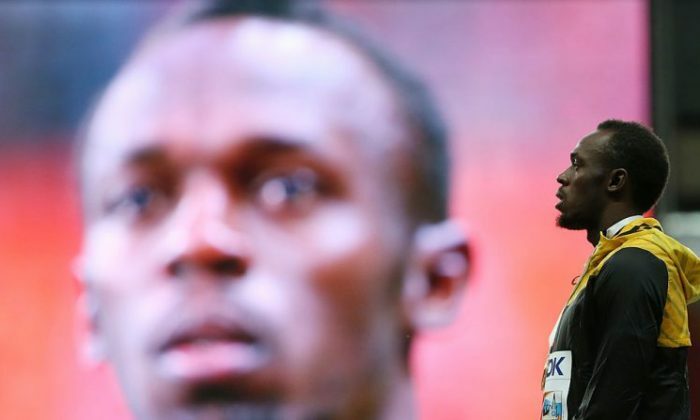 “Even Usain Bolt from Jamaica, one of the greatest runners and athletes of all time, showed RESPECT for our National Anthem!” the president wrote. In the video, Bolt answers a brief question about his nickname. As the first notes of “The Star Spangled Banner” begin to strain, he pauses the interview and turns to honor the anthem in silence. Bolt set world records in both the 100-meter and 200-meter races and won the world championship 11 times. Now retired, he is one of the most accomplished runners in history. On Tuesday, Trump doubled down on his criticism of NFL players who kneel during the national anthem, saying that the league should create a rule that requires players to stand when “The Star-Spangled Banner” is performed. Attorney General Jeff Sessions backed Trump’s stance in a Tuesday night interview on Fox News. “Every American, no matter what their views on the issues, should stand for America, should salute the flag,” Sessions said. Trump’s message comes after two days of protests by more than 200 NFL players who kneeled when the U.S. national anthem was performed. The protests intensified after the president said that players who kneel during the National Anthem should be cut from their teams. The first NFL player to start the trend of kneeling during the national anthem was Colin Kaepernick, who initially sat on the bench during the anthem, sparking widespread condemnation. He then changed the form of his protest to kneeling beside his teammates, saying he was protesting racial injustice and police brutality. Trump has said that he takes issue with latest trend of kneeling because it is being disrespectful to the United States and the flag. Kaepernick became a free agent in 2017, but no team has recruited him since. NFL viewership ratings declined last year and the trend appears to be continuing. Ratings for Sunday Night Football on Sept. 24—when more than 200 players kneeled during the anthem—were down compared to last year, according to Deadline. The Sunday night game between the Oakland Raiders and the Washington Redskins had dropped 11 percent from last season’s Week 3 matchup, which saw the Chicago Bears play the Dallas Cowboys. This Sunday’s Redskins-Raiders game averaged an 11.6 Nielsen rating, which means 11.6 percent of households tuned in for the game. The ratings are also an 8 percent drop from last week’s “SNF” game between the Green Bay Packers and the Atlanta Falcons. Epoch Times contributed to this report.